David obtained a Bachelor of Law and Business with honours in Hong Kong Shue Yan University. Currently, he is pursuing the LLM Programme jointly offered by City University of Hong Kong and Renmin University of China. In 2014, David was appointed as the Public Relation officer of Asian Law Students Association (Unaffiliated Local Chapter). In 2016, he was offered and completed his internship in the First Circuit Court of the Supreme People’s Court of the People’s Republic of China. In 2018, he passed the PRC National Unified Legal Professional Qualification Exam. David has been actively devoting himself in social services. In 2015, David has been appointed as the Executive Committee Member of IT Elite Committee, World Trade United Foundation and the Hong Kong Federation of Youth Energy. In 2016, David has also been appointed as the Director in Hong Kong Youth Enlightenment and Chinese Youth Dreamers Foundation. He has also been elected as vice president in the Achiever Association and Cambodia China Culture Friendship Association. In addition, David has taken part in different Hong Kong uniform groups. David was the Chairman of Group 247 of HK Scout, and now he is a Senior Assistant Supervisor in the Hong Kong Road Safety Patrol. With respect to the public service in the Mainland China, David has been appointed as a Member in Zhongshan Overseas Chinese Youth Federation in 2015 and is active in participation in youth activities. 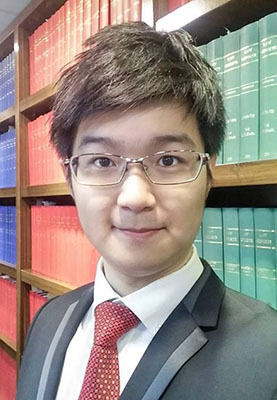 In recognition of his social contribution, in 2018, he was recognised as an Outstanding Youth of Wan Chai District by the Wan Chai District Office and he is an awardee of Outstanding Youth Commendation Scheme by the Home Affairs Bureau of HKSAR government.